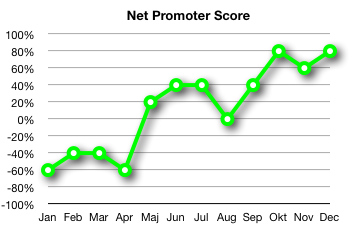 Net Promoter Score: You are silly and asking the wrong question. I love net promoter scores. They are cute, make people feel good about themselves and most importantly they mean nothing in the grand scheme of things. The main reason this is outdated is because a good company shouldn’t care how likely someone may recommend their product or service. Caring if someone is likely to recommend you is the same as asking if someone is likely to wear blue tomorrow or put on your pants right leg first…it means nothing and doesn’t give a metric that people can do anything with. The actual question that should be asked is: “Have you recommend our company to a friend or colleague? Talk is cheap but action isn’t. If people actually refer you then you know without any hesitation that you are on to something…and if they haven’t recommended you to anyone you now have an opening to ask why. …and seriously, how likely are you to tell the truth when asked a question with the word “Likely” in it? Totally agree with you. As Yoda would say, "Do or Do Not". Let's drop the likely. Apple asks both of these questions in it's surveys; I filled one out the other day.